Without any doubt, the Middle East has been a very long-simmering region of violent religious and tribal enmity. In that regard, perhaps today is no different than 1,000 years ago. But given the importance of the remaining oil in the Middle East to the next 20 years of global economic health, the violence and chaos seen there recently is hugely important to the entire world. But it’s also equally without doubt that the US and NATO are inflaming the situation by provoking conflicts and supplying military weapons and training to various extremist groups — therefore deserving much of the blame for the current tensions, despair and mayhem happening in Iraq, Syria, Yemen, and Libya. Forget anything you might read about “brutal dictators” that need to go or the importance of “democracy” to the region. That’s dumbed-down pablum for the masses and has literally nothing to do with the motivations of the (clinically insane) external power brokers actually driving the events on the ground and crafting the narrative that is faithfully scribed and re-told by the media. In fact, disturbingly often, the scribed narrative is exactly opposite of the truth. If a wider war breaks out between the US/NATO and either Russia and/or China, then massive systemic shocks will result to the economy, oil prices, and the global financial system. Some comfort themselves with the belief that such a war would not be in the interest of the true powers that now drive the politics of most countries. Others worry that chaotic systems and events sometimes have a life of their own, regardless of what ‘the powers that be’ may want. We have entered such a time. While predicting the outbreak of war is not my intent here, I do want you to be appraised of the risks. We all should note that the elevated tensions across the globe are as good a reason as any to get our houses in order. As we reinforce often here at Peak Prosperity: when it comes to such preparations, we vastly prefer to be an entire year early than a single day late. Good planning begins with good intelligence. But sadly, if you feel relatively well-informed because you read a lot of newspapers or watch a lot of news, you may be among the most misinformed of them all. Certainly, the events in the Middle East over the past decade have been almost impossible to analyze or understand from a logical perspective. But the pattern has been clear enough: a rough justification of the need for military force is raised by the US adminstration and, within weeks, money and war material are mobilized to do exactly that. Libya, Iraq, and Syria are recent examples of such. Seven countries in five years. Actually, I don’t know how many times the US has poked the bear (Russia) over the past two years, so I thought I’d use “Part IV” to get the point across. It might be a much higher number. First there was Ukraine, where the US and other western parties conspired to overthrow the sitting elected government and putting in place the current crop of ultra-nationalist thugs and Nazi sympathizers that now infest the halls of power in Kiev. The situation there is an unfortunate mess, one the West fomented. Naturally the West was none too pleased when Russia, quite predictably, responded and sought to protect the roughly 8 million Russian speaking citizens living in eastern Ukraine with military support. Money and military aid and the ubiquitous US “advisors” flooded in to help the Kiev militarily dominate eastern Ukraine – ironic, as a few of Ukraine’s current leaders were caught on tape saying they’d prefer to nuke the region in an ethnic cleansing. Then, when the people of Crimea voted to rejoin Russia (perhaps you would, too, if your “elected” leaders dreamed of nuking you), the US reacted as if this were some kind of foul play. That’s a strange sort of needle to thread for a country that prides itself of on “spreading democracy” (even by force, if necessary). You’d think that people voting and exercising their free rights would top of the list of acceptable things to the US — but unless the election outcome is exactly in alignment with US wishes, that’s just not the case. The United States has “operational information” that leads U.S. officials to believe Russian military aircraft hit a hospital while carrying out bombing raids in Syria, the State Department said on Thursday. Since the start of the Russian bombing campaign on Sept. 30, various reports from media and civilian groups have charged that Russian warplanes have hit hospitals with their air strikes. Asked at a briefing whether the United States had evidence that Russian bombing had hit Syrian hospitals, State Department spokesman John Kirby said, “Yes, we’ve seen some information that would lead us to believe that Russian military aircraft did hit a hospital. “We have seen some press reporting to that end, we have seen some Syrian civil society groups say that,” Kirby said. Um…. “some press reporting” and “other operational information?” Good grief, that’s lame. Is that all the State Department has? How about some pictures? Ballistics evidence? Satellite photos? Anything?? The source added that the warplanes attacked the biggest electric power plant that feeds Aleppo city, which resulted in cutting off power from most neighborhoods in Aleppo city. This transgression comes only 8 days after two F-16 warplanes belonging to the alliance targeted two power plants in al-Radwaniye area east of Aleppo city, cutting off power from the area. Given that charge, you’d think at least a denial from the US was in order. But none has been made. If the allegation is true, though, then it fits a larger pattern of the US criticizing other countries for doing the very same things it does. RIGA, Latvia — In a significant move to deter possible Russian aggression in Europe, the Pentagon is poised to store battle tanks, infantry fighting vehicles and other heavy weapons for as many as 5,000 American troops in several Baltic and Eastern European countries, American and allied officials say. These moves are indicative of worsening relations with Russia. They show an over-reliance on military options and a woeful lack of diplomatic outreach, at least any that are being reported in the news. Of course, the risk of all this being interpreted by Russia as ‘overtly hostile’ is pretty much 100%. If you are having similarly hard time trying to understand the US’s policy in the Middle East, you’re not alone. The shifting alliances in play there are really hard to keep track of. Turkey has been aiding the so-called Syrian rebels (more on those rebels in a minute) but maintaining its long-standing hatred of the Kurdish people. The US has been arming the Kurds and Syrian rebels while maintaining a mutual relationship with Turkey. Iraq has been struggling with ISIS and accepting help from Iran to deal with them. This puts the US and Iran on the same side of the battle, if you believe that the US is actually trying to stop ISIS rather than covertly helping it. Why would it possibly help ISIS? Because ISIS is battling Assad’s government in Syria. WASHINGTON — Foreign fighters are streaming into Syria and Iraq in unprecedented numbers to join the Islamic State or Iraq and Syria (ISIS) or other extremist groups, including at least 3,400 from Western nations among 20,000 from around the world, U.S. intelligence officials say in an updated estimate of a top terrorism concern. There are dozens of reports indicating that the US, through the CIA and other outfits, has been responsible for a big part of both recruiting and training these foreign fighters, who draw from such nations as Pakistan, Afghanistan, Saudi Arabia, Chechnya and Qatar (among many others). In short, anyone and everyone who could be used to topple the government of Syria is being drafted. 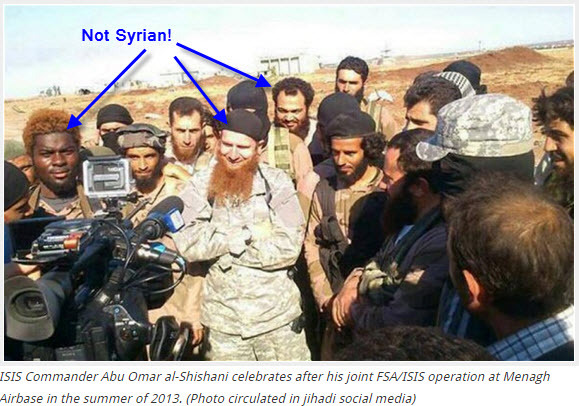 I knew how ridiculous the claim of “Syrian rebels” was when I saw this picture showing the prominent ISIS leader Shishani, a well-known Chechen who was reportedly trained and backed by the US while in Chechnya. But sharp eyes will also easily pick out the fact that he’s surrounded by people clearly not of Syrian origin. In fact, it looks more like a UN diversity conference than a Syrian rebel group. For the sake of appropriate context, imagine if China were funding “rebels” to attack and fight inside the US, and that these “rebels” were sourced from Mexico, Nicaragua, Argentina, and Peru. These images and reports clearly show the pattern in play: the US and Turkey have been funneling vast amounts of arms, money and training to so-called opposition groups that, in many cases, consist of mercenaries and jihadists from a very wide range of different countries. Therefore, the US has directly supported and incubated some of the most brutal terror organization on the face of the planet — a list including ISIS and the Al Nusra front, both of which are well-documented for having committed horrible civilian atrocities. A declassified secret US government document [a US Defense Intelligence Agency (DIA) document then classified as “secret,” dated 12th August 2012] obtained by the conservative public interest law firm, Judicial Watch, shows that Western governments deliberately allied with al-Qaeda and other Islamist extremist groups to topple Syrian dictator Bashir al-Assad. According to the newly declassified US document, the Pentagon foresaw the likely rise of the ‘Islamic State’ as a direct consequence of this strategy, and warned that it could destabilize Iraq. Well, of course the Defense department knew that arming and funding violent jihadists was going to lead to some crazy sectarian unpleasantness. How could they not? 14 years in Afghanistan and Iraq taught them plenty about the region and its sectarian dynamics. But make no mistake: the US worked hard to attract regional jihadists to Syria to fight their war for them. That was not an oddity to be curiously noted, but a feature of the program. Why? Because there was not enough legitimate internal Syrian opposition to Assad to get the job done. An angry mob had to be recruited. Said another way: Syria’s bloody civil unrest is not entirely the result of a natural social uprising, but was fostered with a great deal of external meddling. Tensions are as high as they’ve been in decades. Neo-con hotheads with a track record of shooting first and not caring to ask questions later are still driving US foreign policy. Russia is signaling that it has had enough of American intervention that destabilizes volatile parts of the world. China is flexing its muscles as well. This is all happening while global economic system is not nearly as robust as advertised. And history shows that nations always react more aggressively during leaner times. With so many sensitive flash points that the West has its fingers in these days, the risk of one or more of them erupting into a full-scale war between the major world powers is not dismissible. And given the huge cost should that come to pass, it makes all the sense in the world to take precautionary measures in advance. In Part 2: How Things May Well Get Ugly Quickly we zero in on the largest risks to monitor and the likely range of forms of retribution the US could face (from financial and cyber war to a full-blown shooting war) should the situation worsen. We’re not trying to drum up fears that war is imminent. But what we are saying is that the risk is substantial enough, and the potential cost high enough, that it’s worth making some pre-cautionary preparations at this time.